fragmented is a band. out of new orleans. | the remarkable freedom of ideation. | ambient? industrial? experimental? drone? noise? fragmented is a band. out of new orleans. ambient? industrial? experimental? spooky? brooding? strange. smooth/soothing to discordant and everything in-between. contact fragmented if you're interested in... well, whatever. licensing (on to the serious business: perfect for movies/tv/any type of sound bed). you like the music. you hate the music. you just want to talk. you need more detail? let's try to describe fragmented. what if frank zappa, nine inch nails, brian eno, aphex twin, sonic youth, and cabaret voltaire had the same dream at the same time? maybe that's fragmented. fragmented is a creation of one person(?) ego(?) being(?) over the past 25 years. a soundtrack... smooth yet discordant. to some it's just weird, to others it works for something. what that something is, that's for the listener to define. it's like a found object. 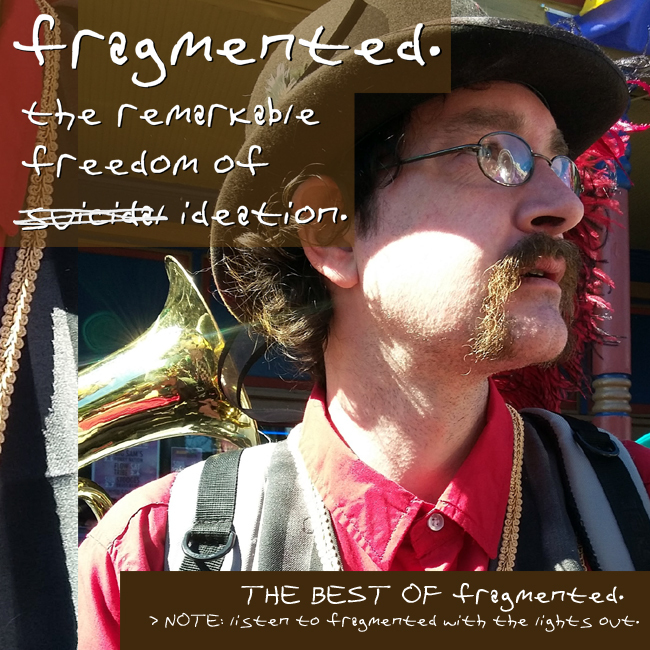 fragmented is out of new orleans, that may help explain some things. listen to fragmented with the lights out. fragmented may be soothing, it may be grating. it's an emotional waveform. © 1992-2019 Christopher John Falvey. All Rights Reserved. Contact fragmented for information on licensing, etc. More about Christopher J. Falvey (art, photography, words, business).